When shopping for fruit trees to plant in containers, research species that are clearly labeled in the garden center or nursery. You should be able to gain enough information on the rootstock, the space that is required and whether the plant is self-fertilizing or will need other trees around it for pollination. When shopping for fruit trees like apple trees to use in a container, choose a dwarf rootstock with a family of three or four compatible varieties grafted on it so that no further trees are needed for pollination. When shopping for containers, be sure to choose containers that are suitable for the needs of the plant you are growing. 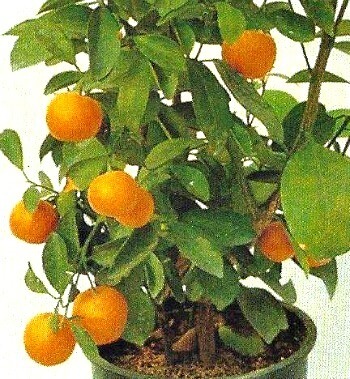 Fruit trees prefer a free root run so you will need containers which are generously proportioned. Some fruit trees like cherries, plums, pears and apples require containers that are at least 15 inches deep or more. In fact, the deeper the container, the better the chances for the plant or tree to grow its roots. Some gardeners may also experiment with using trashcans or washing tubs as homes for their container growing plants. Although they may not be the most attractive choice for use as containers, they do make perfect homes for your fruit trees. You can dress your trash can for better visual impact if you decide to choose them as options for growing your container growing fruit trees. You can choose a galvanized metal trash can for an industrial appeal or wrap bamboo around an inexpensive plastic container. The latter is a good option to make because the decorative natural wrapping will provide insulation during winter. Some gardeners might invest in clay pots. They are very attractive and work well for strawberries but they tend to dry out quickly, and chip or crumble if left outdoors during a cold winter. 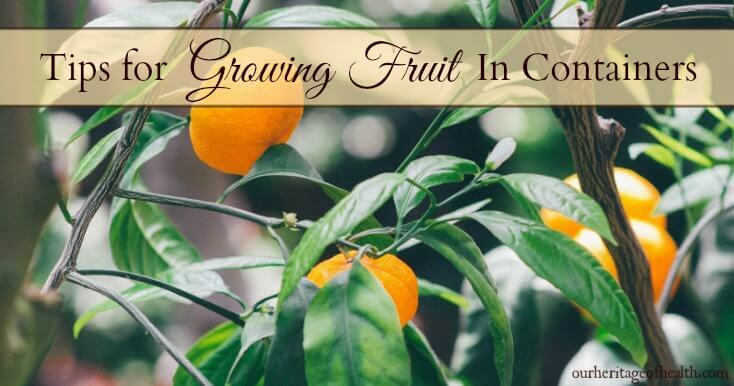 There are certain considerations the container fruit gardener needs to make when planting fruit trees or plants in containers. You need to pay attention to the planting, watering, feeding and potting of your plants. One good way of reducing the effort involved in potting every two years is to plant your fruit tree in an over-sized container with good organic potting compost. During the time your plant grows, all you need to do is to lift the plant when required and add further layers of compost beneath the first until the plant eventually outgrows the container. It is also best to arrange some sort of permanent watering system for containers to save work and ensure the compost doesn’t dry out. In hot weather, you may find that the container-grown fruit tree may need to be watered at least three or four times a day. As such, it is worth investing in a watering system that provides for such opportunities. In winter, you will find that watering is not needed as often as summer time watering requirements. Always choose container-grown fruit fruits with a good track record for the best chance of success. Many gardeners may enjoy planting strawberries as they are a perennial favorite and can be grown in all sorts of containers. You can harvest a good number of strawberries even planting them in small pots and setting them on a window sill. Growing strawberries in containers comes with additional benefits as well. For instance, you can reduce the risk of slug attack and remove the need for laborious mulching and weeding that is required when growing strawberries in the ground. Figs are also excellent choices for growing in containers since they like having their roots restricted. This is in contrast to grapes which are a type of fruit that will never do well in containers since they do not like their roots restricted. Generally, it is harder to find pears as container growing plants since the smallest variety grows up to about 8 ft in height. Apples on the other hand, make good container plants and are available in dwarf rootstocks. As with apricots and peaches, containers selected for apples should be thick, wooden or plastic tubs or barrels measuring at least 2 feet wide and 3 feet deep. Some gardeners also enjoy growing raspberries in containers although growing them could pose some challenges since they could become an untidy choice for decorative planting. Moreover, raspberries grow tall and may require staking and netting when grown in containers. Blueberries on the other hand, thrive well in large plastic, wooden or ceramic pots that are at least 2 feet wide and deep. They do not need much pruning and grow only a few feet high. 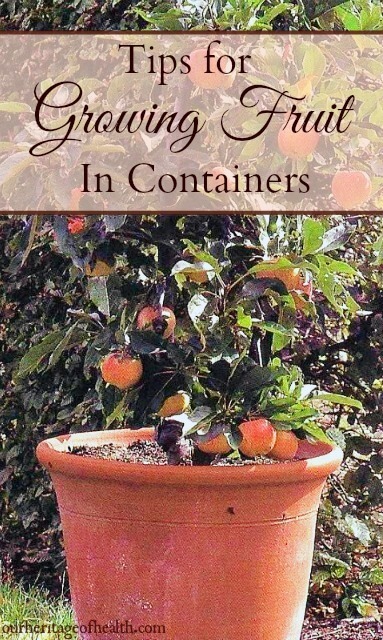 Container-grown fruits are an attractive and rewarding addition for any garden. When placed in a spot sympathetic to their needs, container-grown fruit trees and plants can give you tremendous flexibility to experiment with new ways of fruit growing. When shopping for containers for your fruit trees, choose containers which have thick walls as these will slow moisture loss and insulate the roots from extreme air temperature swings. You should also ensure the containers have drainage holes so the roots won’t get waterlogged. Containers allow you to decorate and adorn your deck, balcony or patio, enabling you to move the plants to take advantage of the available sunlight in a mostly shaded garden. They are a great way to grow your fruits without putting a lot of work into a full-scale garden. Cindy Keller is a writer, blogger and a gardening enthusiast who lives in suburban New Jersey with a menagerie of animals and a family she loves. When she is not busy sharpening up efforts to grow her precious rose garden, she can be found thumping her fingers away as a Customer Service Manager at MyGardenGifts.com.